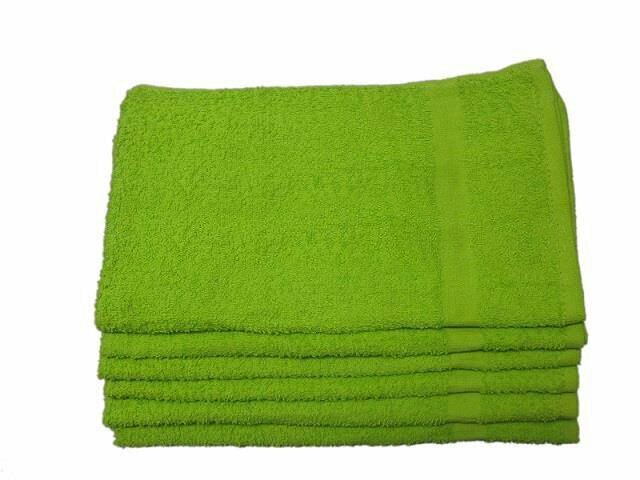 Wholesale Hand towels Lime green in premium extra soft quality. Made of 100% cotton popular with hair salons, nail salons, gyms, schools, sports teams. Durable and long lasting. Introduce zesty, bold color into your décor with affordable 16 x 27 hand towels, available in lime green! Our pure cotton towels are built to last and are durable enough to withstand daily washing. Incredibly affordable, soft and absorbent, these towels are sure to bring a smile to your face — while keeping money in your wallet. 100% cotton construction that won’t shrink, warp or fade. Wash our towels once and see how quickly they fluff up! These thirsty towels, weighing in at 3 lbs. per dozen, dry fast and stay soft, too. Use these towels again and again. A burst of color, but the option to go neutral. Check out our collection, and you’ll discover that Towel Super Center has everything you need. Buy white towels, black towels and towels that come in every color of the rainbow. You’ll also find bath towels and mats, plus a huge selection of towels in all sizes and fabric weights for businesses of all kinds. Savings your budget will appreciate. Pay as little as $10.99 per dozen for our popular hand towels! Plus, because we pack them tightly for delivery, you’ll save on shipping fees. Smart buyers love Towel Super Center because we carry a diverse selection of towels at affordable prices.